This family friendly vacation rental apartment, located in the amazing city of Florence, Italy only a short distance from the city center, consists of 4 bedrooms, 2 bathrooms and accommodates up to 12 persons. 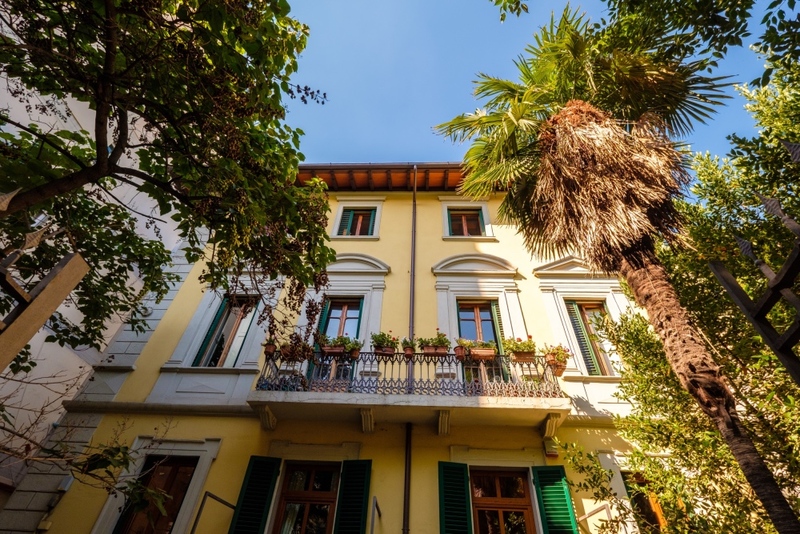 Situated on the 2nd floor of an Italian "palazzo" in a tranquil neighborhood, this 4 bedroom - 2 bathroom apartment rental can accommodate up to 12 persons. The main entrance opens to hallway which runs the length of the apartment. The kitchen, dining room, and a double bedroom reside to the immediate right of the entrance. Outside of the kitchen is a quaint terrace, overlooking the terracotta roofs of Florence. Further down the main hallway, on the right, are two bathrooms, both featuring a shower, a WC, sink & bidet. At the end of the hall way you find the second bedroom, with three single beds. To the left, you will enter into the living room area, and have access to the two remaining bedrooms. The apartment is convenient, spacious and is bathed in natural light, you will find the accommodations tranquil and silent. The 4 excepionally large bedrooms are soundproof for your comfort. The inviting common space is ideal for groups furnished with a sofa, armchairs, games and activities for children and adults. Upon request a roll away bed can be placed in this room. Family Friendly Apartment :: Centrally Located :: English Speaking Hostess :: dates fill-up fast. yet not too close so that you have to deal with traffic, city noise and loads of tourists! 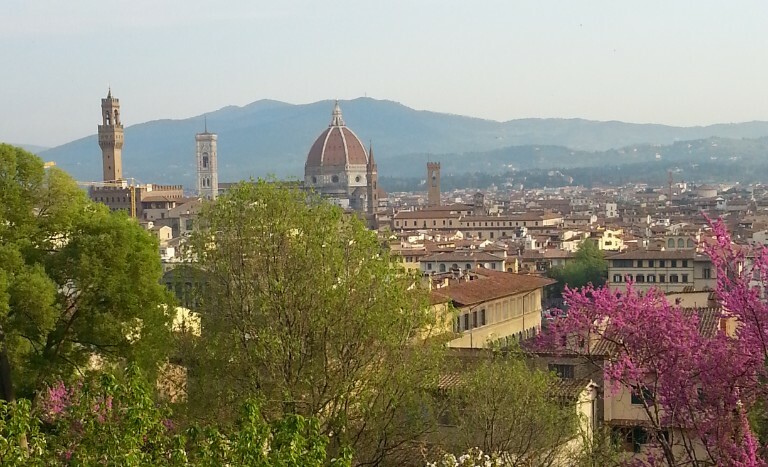 Why didn't I plan on more days in Florence? And it is true! There is so much to see and do, you can spend your entire vacation exploring this exciting city its incredible museums, monuments and beautiful churches. With the national train service stopping in the city center, and easy access to the main roads going north/south and east/west in Italy, Florence is an ideal base for an adventure. Discover the beauty of both the region of Tuscany, including cities like Pisa, Siena, Lucca, San GImignano and Chianti). Guests & Owner share a private entrance with separate apartments. The accommodations are located on a wide tree-lined street which has free parking so you can pull your car directly in front of the house for loading. There is a secure entrance and a private gate area between the wide sidewalk and front door for safety of small children. There are stairs, this apartment is not suitable for mobility impaired travellers. Our prices are per night for a minimum of a two night stay. The base price includes 8 persons, and there is an additional cost for each guest up to 12 total in the apartment. LOW SEASON October - March is 175.-Euro per night for up to 8 persons (15.-Euro per night for additional guest up to 12 guests). HIGH SEASON April - September is 250.-Euro per night for up to of 8 persons (20.-Euro per night for additional guest up to 12 guests). There is no security deposit and all water, gas & electricity are included in the price above. Ask me about our special offers for LDS guests! We like to tell out guest that this area is the “REAL DEAL” because it is an active neighborhood, there are plenty of grocery stores, restaurants, pastry shops & cafes, gelaterias & morning market which is loaded fresh veggies, fashion stalls and much more. We also suggest taking the time to enjoy a picnic at one of the beautiful local parks and gardens. The historic center, where you will find many of the more important museums, monuments and churches are a short walk away or you can use the easy & convenient public transport with bus stops almost directly in front of the main gate. The apartment is outside of the "dreaded" ZTL zones, and there is free parking all around the vacation rental. My name is Heather and I do my best to make the experience for my guests the best it can be. While you are here, you have your own private apartment, but I am close enough to help with anything that you need. You will be greeted with snacks, water bottles and fresh flowers in the front room and I like to leave the house stocked with the basic necessities.